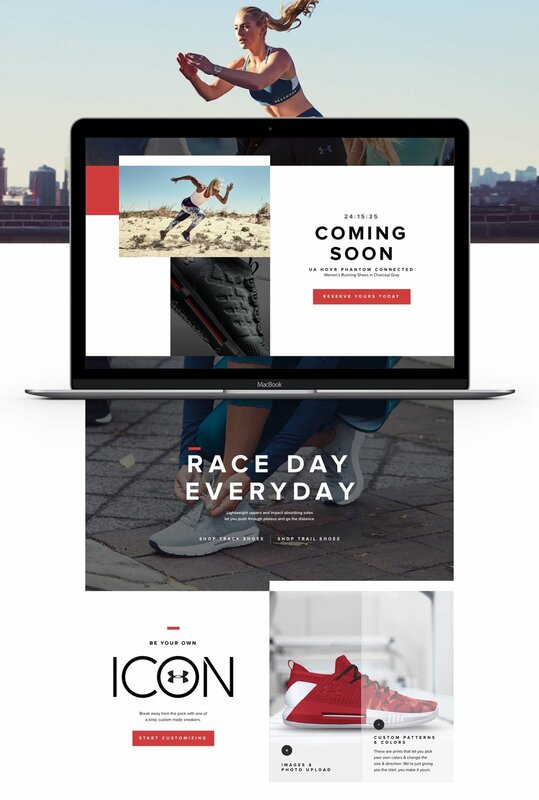 As the third largest athletic brand in the world, Under Armour has a reputation for bringing athletic performance to life through passion, design, and innovation, and needed an updated ecommerce strategy and design to match. Breaking their business into three themes (Brand Elevation, Customer Focus, and Product Showcase) allowed us to explore conceptual ideas and visual design treatments for tomorrow’s Under Armour experience. A new Under Armour website needs to do a lot of heavy lifting to deliver on the “Makes You Better” brand messaging. Focusing on great story telling behind the brand and collections allows the site to bring performance to life and makes the brand more relatable to connect with customers on an emotional level. Under Armour struggles to make a connection between their pro-athletes, ambassadors, and influencers to their every day customer. To bridge that gap, the new Under Armour site can deliver a true omni-channel experience, connecting the site to app-based location, products, training, and events, using all data touchpoints to deliver personalized recommendations at exactly the right moments. Under Armour has an obsessive commitment to design, style and technological excellence. By providing smarter product pathways, embracing an “of the moment” mentality with timed releases, and creating engaging sizing and fit tools and content, we can provide customers with a deeper understanding of product offerings.